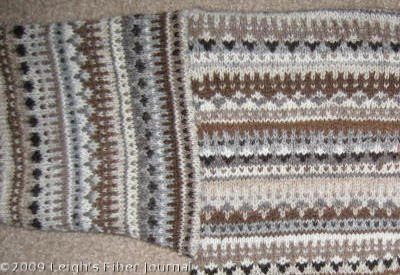 Now that the front and neck bands are done, progress on my Shetland Sampler Cardigan has picked up. 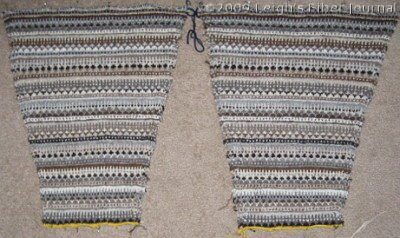 The Siamese sleeves have been completed for awhile now. I sewed and cut them the same way I did the other checkerboard steeks. I really liked the Siamese sleeve technique and will definitely do it again. I sewed the sleeve seams by hand with some extra Shetland yarn. I was delighted (and relieved) that they fit the armholes perfectly. Overall, I am very happy with the fit. The only problem was that the sleeves were a little too long. And this is before the cuffs are added. Then I pulled out the stitches in the row above the needle. If you look closely at the photo below, you can see the plastic part of the circular needle, with my stitches safely on it. I used it much like a safety line. To knit the cuff, I had to transfer the stitches to double pointed needles. 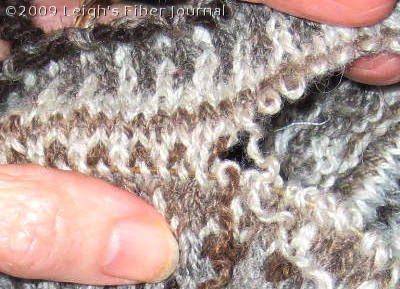 It is in the same K2P2 as the rest of the ribbing. So. One cuff down. One to go. 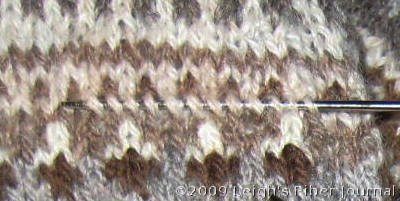 I should finish knitting the one cuff left of the sweater I'm knitting for my husband at knitting this week. (Un)fortunately we're getting a ton of snow right now, so it looks like he'll still have enough winter left to wear the new sweater with pride! Hi Sue. We got snow yesterday! Our first of the season. Fortunately we still have electricity. I'm counting on a little more cold weather to be able to wear my sweater. It is beautiful! Congrats on a well done project. I too learned a lot. Maybe this year I will get around to spinning my Shetland! That is just amazing. The sleeve technique really worked well...they are seriously twins! It's all taking shape beautifully! 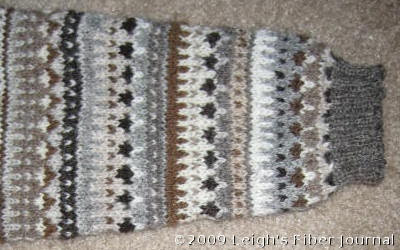 Leigh, you're really making me wish I was something more than an abysmal knitter. This is truly gorgeous. Very nice I've injoyed watching the entire process! Circ as a lifeline is a great idea. Now you're on the homestretch! Lots of winter still ahead, I'm sure. It's looking very good Leigh, a pleasure to see. Impressive - every bit of it. It looks wonderful. Certainly worth the time it took to make it look perfect, which it is. I've got the second sleeve done and am doing the finishing touches. And I'm happy to report that we still have snow on the ground and cold weather! I heard that there was snow back in your area and wondered if you were having some "weather" like ours. Your sweater is just knockout gorgeous. Cant wait to see the "whole thing" :-) T.
Hi Leigh! Wow! Your work is beautiful. I would love it if you would consider linking up with us one Friday on Fiber Arts Friday. I know my readers would love to discover you and your blog. Very inspirational!